Click here to listen to the inventors tell their story (15 min). 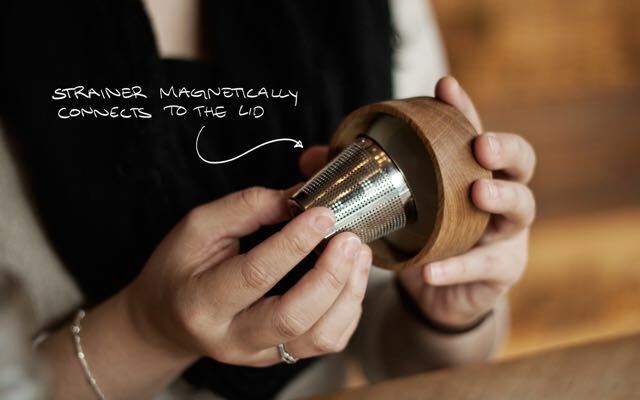 Three college students in Bellingham, Wash., set out to design an innovative magnetic brewing vessel to flip your world upside-down and throw tea bags into the past. Now they are raising money to launch this project – lots of money. A 30-day Kickstarter campaign that ended last week received $362,679 from 6,248 backers. The team’s initial $20,000 goal was met May 4, the day it launched. The infuser design was a fund-raising project at Western Washington University created to support the Industrial Design Program. 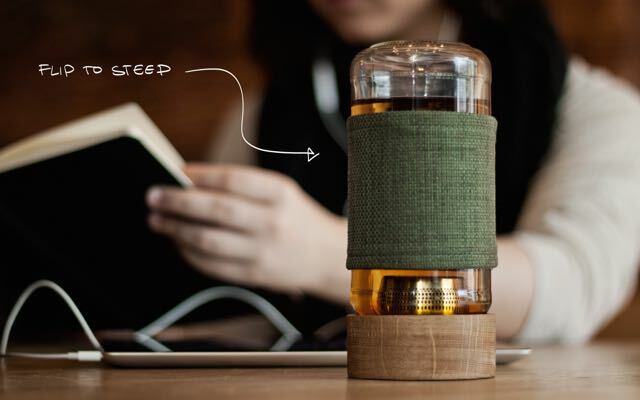 The Imbue vessel has a magnetized loose-leaf tea holder on the inside of the lid. When you flip the container upside-down, it brews the tea. Once steeped to that perfect shade, you can flip it right side up and remove the magnetic holder to enjoy your drink. All of the vessels were manufactured on campus utilizing student labor. The inventors used a cylindrical cutting tool to robotically cut out all the lids and then did finish sanding and assembly. Juniors in the Industrial Design Program Dan Taylor, Leah Cohen-Sapida, and Ashkon Nina are responsible for this new invention. In December, once they finished developing a prototype, they made 150 vessels and introduced their product to the public. “Then they sold out, and you couldn’t buy them anymore. We got so much good feedback, and people who wanted more. So we decided we were going to take it further,” Nina said. The students then decided to launch a Kickstarter campaign, recording video and publishing schematics. 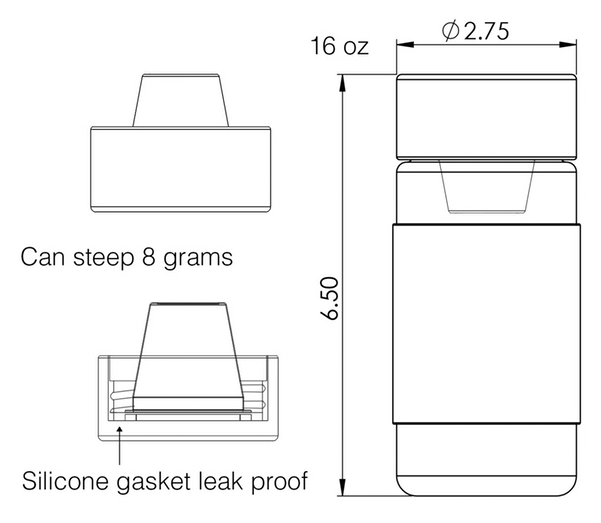 The Kickstarter was meant to bring this product into full production. They’re now working with an overseas manufacturer to produce the infuser in larger quantities and to reach a broader audience, according to Taylor. The campaign raised 18 times their goal. Donors purchased as many as 10 at a time and it remains unknown exactly how many units have been sold because there were so many different donor packages and so many backers. The Industrial Design Student Association (IDSA) raises money for the students in the Industrial Design program at WWU. The students plan on giving back a lot of their profits to the association once it is determined how much will be needed for full-scale production costs. They are also working on final modifications and new models. “We looked at a bunch of other tea solutions out there and none of them allowed you to easily get the tea out once it’s done brewing. So you brew it and it just keeps brewing while you’re drinking. That’s the unique thing about this product [is that you can easily remove the tea],” Taylor said. According to Cohen-Sapida, they researched studies on how long you’re supposed to actually brew tea and they found that it was supposed to be around three minutes. But they recognized there are different steep times for various styles of tea. Everyone likes their tea differently, she said. “This gives you the opportunity to stop, if you don’t want to keep brewing, you don’t have to,” Cohen-Sapida said. Currently, the vessels sell for $30 on their website, http://imbuetea.com, and are may be pre-ordered online. According to the Imbue Tea website, shipments should begin around October 2015. Nanette Jackson is a student at Western Washington University. Reblogged this on Read 'em and Steep.